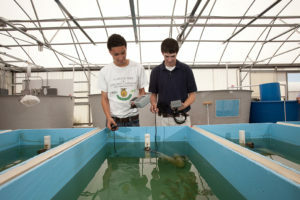 For more than 15 years, staff at FWRI’s Marine Hatchery in Port Manatee have been working with school administrators, teachers and students to bring Aquaculture and Stock Enhancement Research (SER) into the classroom. Aquaculture in the Classroom program is designed for students ranging from fifth grade through college, to teach them the basic principles of aquaculture, marine research and how stock enhancement plays a role in supporting Florida’s marine fisheries. So how does it work? Staff at the Stock Enhancement Research Facility (SERF) provide participating schools hatchery-reared red drum (Sciaenops ocellatus) along with starter feed and technical advice on how to raise the fingerlings in the classroom. Information on system development and grant opportunities are also provided. 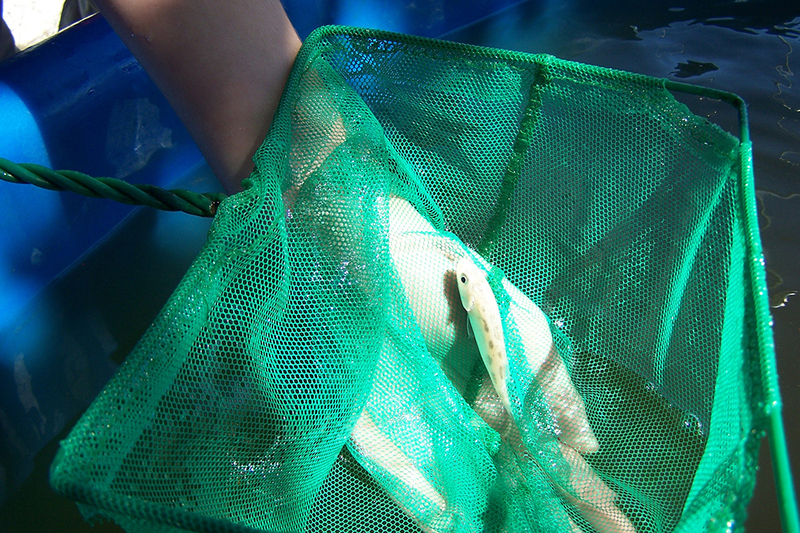 At the end of the school year, the fingerlings are harvested and donated to local shelters or returned to hatchery to be used for outreach and education exhibits. What do the students learn? SER staff work with teachers, who develop a curriculum that satisfies Florida Sunshine State Standards and provides students the opportunity to design aquaculture (fish-raising) systems, perform daily animal husbandry (care) routines and conduct research projects such as salinity tolerance tests, feed studies and water quality/chemistry investigations. How many schools participate? Since this program began in 2001, more than 25 Florida schools from Miami to Pensacola have participated. This year, 10 schools participated statewide and 1,278 fingerlings were distributed. Many Schools like Crystal Lake Middle, Forrest Grove High and Canterbury School of Florida can rear fish all year round in recirculating aquaculture systems. To learn more about the program, or to refer a teacher or school, please contact Gina.Russo@MyFWC.com.